Back in the days of World War II, Uncle Sam extended the call and young men crammed recruiting offices and enlisted in the Armed Forces. Unlike unpopular “wars,” the teens and men had no qualms about enlisting. They felt less than masculine if no branch of the military service wanted them. 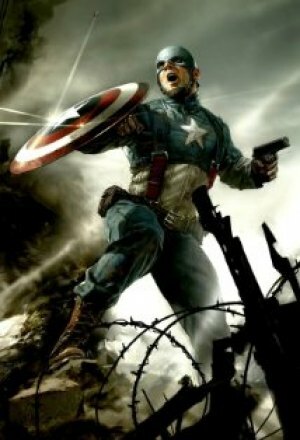 Filmed with a worn darkened tone, “Captain America” pristinely captures the era threatened not simply by Hitler but a separate organization known as Hydra and led by the Red Skull (Hugo Weaving). Strengthened by meaningful snap crackle (“someone get that [skinny] kid a sandwich ] dialogue, the First Avenger grasps a commodity often neglected or forgotten in superhero flicks: It immediately establishes empathy for Rogers through an aforementioned alley beating. His good natured personality compounds with determined resolution. “Captain America” contains elements of the 40s ( chorus line, bond drives, and Nazis), but the film blasts into a cliffhanger on steroids through 21st Century effects, including NYC foot and car chases for an appetizer and a drop on a speeding train. Initially, assigned to entertainment “promotional” activities, Rogers abilities go past a simpleton wearing tights and holding a shield. Eventually, Peggy Carter (Haley Atwell), a member of the experimental team, helps smuggle him on a rescue mission, where one-on-one fights and specialized weaponry debut. Don’t be fooled that this is a super hero at war flick. The superstitions, the occult and mastery extraordinary destructive power elevate the stakes, yet, students of history ably understand subtle symbolic insertions, such that the development of more powerful weapons equates elements of the nuclear bomb building Manhattan Project. Evans evokes both a humble aspect (“Asking a woman to dance is terrifying”) and the requisite bravery, endurance and sacrifice. By the way, don't leave your seats, there's a tantilizing Summer 2012 preview after the credits.